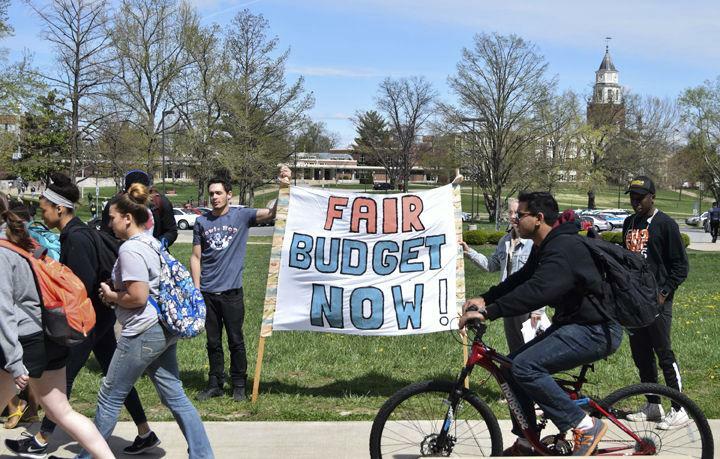 On the nine-month anniversary of the Illinois state budget impasse, a group of students decided it’s time to rethink the higher education crisis. A small group of students stood at a table Friday outside Morris Library asking passersby if they knew about the $22,856,000 in proposed cuts to the university. Joon Kang, a graduate student in social work from Naperville, helped organize the event through Speak for Illinois, a local group formed in March to raise awareness about the stalemate between Republican Gov. Bruce Rauner and the Democratic-led Legislature. The impasse has left universities and colleges without funding since July 1. The purpose of the rally Friday was to stand in solidarity with protesters in Chicago, Kang said. He said Northeastern University and University of Illinois at Chicago also held protests Friday. Kang said it’s important to build a network across the state, but getting SIU students interested and involved is the most difficult part. “We have to be working on our message to directly educate people on why this matters to them,” he said. He is not the only person who doesn’t think enough students are involved. OPINION: Where’s the student outrage about the budget impasse? Juliet Fitzgibbon, a freshman from Bartlett studying plant biology, said there must be more passion and direction behind the movement. “It’s really easy for students these days to be mad and frustrated about this and then just sink their heels in the dirt and say, ‘Oh well, we won’t be able to go to school anymore,'” she said. Fitzgibbon attended a Speak for Illinois meeting Wednesday where SIU President Randy Dunn and former Lt. Gov. Sheila Simon spoke about the budget crisis. Fitzgibbon said she was disappointed when she was one of only about 30 students in attendance.